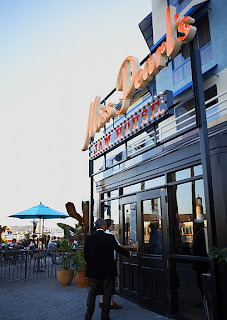 One of the more buzzworthy restaurant openings of the last quarter is Miss Pearl's Jam House, housed in the JDV-operated Waterfront Hotel in Oakland's Jack London Square -- one of the most recent restos to be Touched By Joey Altman. Will this swanky, Caribbean-themed spot pass muster among serious foodies? By most accounts, no, but it is going to be a d*mn dependable spot for kitschy good times, fun cocktail occasions, some tasty bites, and sunny waterfront brunch. I hopped on BART recently and met my East Bay dining fave Fresh Pink for some cocktails and dinner at Miss Pearl's. It's a short bike ride, long walk, or short cab ride from the downtown Oakland/12th St. BART station. Personally, I am a huge fan of hopping on the ferry from SF's Embarcadero Ferry Building to Jack London Square. It is beautiful, and there is a bar on the ferry!! Unless you are going for brunch or an early dinner, you can't really take the ferry back to San Francisco, but past jaunts to BBQ at Everett & Jones and drinks at the First and Last Chance Saloon have taught me that all you have to do is get in a taxi and swing over to the BART station before the last train. Why oh WHY does BART not run late? So here's the deal with Miss Pearl's. As noted elsewhere (Eater SF for example), it's a theme restaurant. This makes for very entertaining interior design! Thursday through Saturday nights, they bring in live steel drum musicians, and the atmosphere in the spacious, turquiose blue-walled bar area kicks up from "hotel bar" to "grown-up party zone" within moments. 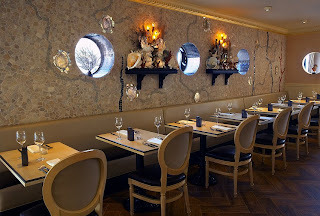 From our expensively upholstered booth in the oddly circuitous dining room (there's no there there), we could just barely see people dancing and having fun. Definitely wished we'd thought to sit in the bar for dinner, but by then it was too late. Still felt fun, though. Indubitably, this fun feeling was enhanced by the $4 passion fruit Jell-O shots for which Miss Pearl's was famous in its former iteration at SF's rocker-friendly Phoenix Hotel. The cocktails are a little heavy-handed and clumsy, however -- nothing like us spoiled brats are used to now that the Bourbon & Branch era of mixology has taken hold. 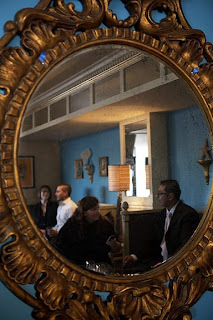 The service is friendly and attentive; our server, Adam, took excellent care of us and deserves props for being informative, honest, and easy-going. No, the staff does not have every single detail nailed (see Bauer's review in the Chron for a more brutal assessment), but it is absolutely above par for a hotel restaurant in a tourist zone. The food? Ah, the food. For a foodie snoot, it's a total mixed bag. For your average diner, it's great! The Fabulous: Miss Pearl's Jamaican Pepperpot Soup. Laced with savory braised oxtails, tomato and okra, this velvety, vegetable-packed soup is so good that I would go back just for another bowl of it. A cousin of gumbo, this soup is a winner. The Good: a starter of grilled shrimp with avocado and grapefruit from the raw bar. Delicate, perfectly cooked shrimp, caramelized on one side and just-translucent on the other. The Misguided: raw ahi tuna slathered -- no, pigpiled -- with cold coconut-lime-chile cream. Just a tablespoon of that stuff would be perfect; it's actually very tasty. But in such amounts, the dish, "Coco-Beche" ($9) became vulgar -- even slutty! This is by no means a full review, just a few notes on a new spot. Check it out for yourself! Take with you low expectations, a love of waterfront kitsch, and a thirst for booze. I plan on going back sometime soon for brunch to try the chicken and andouille hash with poached eggs, red chile sauce, and roasted green chile hollandaise ($14). Will I sneak a few Jell-O shots while I'm at it? I'm not saying, but I'm not not saying either.